I have been around dogs for the last 40 years or so. As a child, before I was allowed to own a dog of my own, I made friends with my neighbour’s dog, Kim. She was my best friend and I learned so much from her, we went everywhere together. Unfortunately it wasn’t until my adult years that I learned how upset she must have been when I stopped calling for her – the reason, yes you’ve guessed it, I got a new puppy of my own. Kim’s owners said to me many years later that she was known as 'Eleanor’s dog', and they wished they had given her to me (oh how I had wished for that too!). Our new family puppy was named Butch, he was anything but butch – he was very sweet. He lived with my parents until the ripe old age of 17. Although I pursued a career in a different direction, my passion always lay with my dogs. I qualified as a Puppy Tutor with Puppy School in December 2006, and I started running Puppy School Training and Socialisation Classes in February 2007 as a hobby business. I have helped over 1000 new puppy owners train their puppies over the last 11 years. I decided to hang up my Financial Hat on 20 December 2012 after 36 years in various roles, to work with puppies and their owners full time. I'm now the proud owner of the Puppy Club with Puppy School Falkirk. I have many years of experience as a dog owner, sharing my life through the years with a few best friends, each one different and leaving a paw print on my heart. I currently share my life with my husband, daughter, four Welsh Springer Spaniel's (Brooklyn & Blair, and Blair's two daughters - Berry & Brogan, and my two Hungarian Vizsla's (Briagh & Bea). All good fun! Let me introduce you to my furry kids: Brooklyn is coming up for 15yrs old on the 30th March 2019, she is mother to Blair who is so sweet and is 8yrs old. Blair's daughters (Berry & Brogan) are now 5yrs old, and Briagh is my Hungarian Vizsla, she is almost 11yrs old and such a great girl, and last but certainy not least there's our not so little Bumble Bea who is just over 6 months old. I have successfully raised three litters of puppies, which was great fun and always using force free training methods. A puppy is never too young to learn. I have taken Briagh and the 3 welsh springer girls into the show ring and we enjoyed the fun. 2015 was a very busy year for learning (education in dog training never stops!). I spent 2 seperate weeks at Cheltenham Rescue Centre training rescue dogs with other lovely Puppy School Tutors. All of the dogs involved were successfully re-homed. 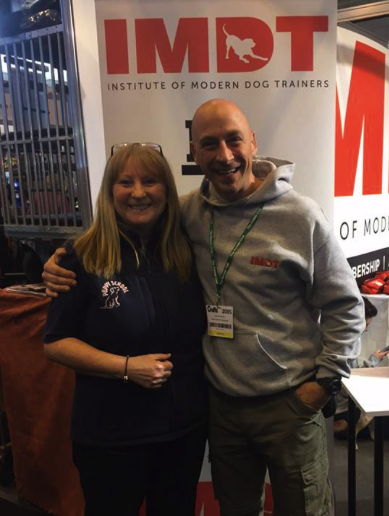 I spent a week in Malaga, Spain completing a 4 day practical dog trainers course with Nando Brown from the Institute of Modern Dog Trainers (IMDT). I also attended lots of seminars and workshops - too many to mention. I am proud to say I qualified as a fully Certified Dog Trainer with the Institute of Modern Dog Trainers (IMDT). 2016 was a busy year - continuing my further education journey and opening the new 'Doggy Day Care Academy' in Falkirk. 2017 was a year of growth. Introducing new classes whilst the Doggy Day Care Academy continued to grow, a further assessment of my skills as a dog trainer with IMDT, and as a result I continue to be a full member. 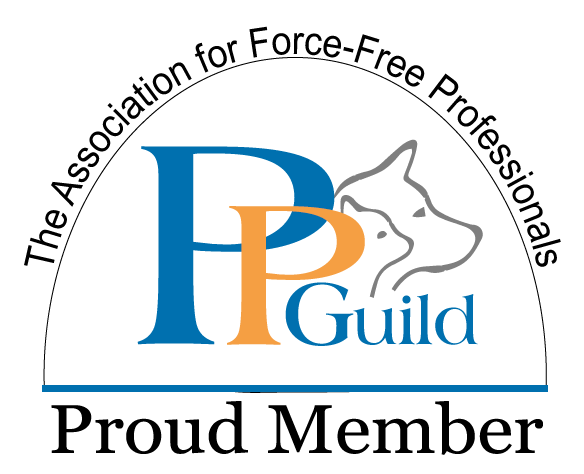 I qualified to offer Scent Work UK scent classes at Level One, and continue to be a full member of the Pet Professional Guild. 2018 promises to be busy too - watch this space! 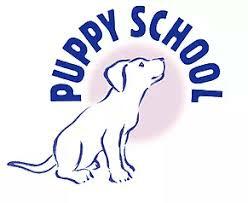 The Puppy Club with Puppy School Falkirk services are fully insured.